From Caroline and Raquel, and now to Sigrid Agren and Patricia van der Vilet, it appears that the latest issue of Vogue Nippon is filled with amazing twosomes. 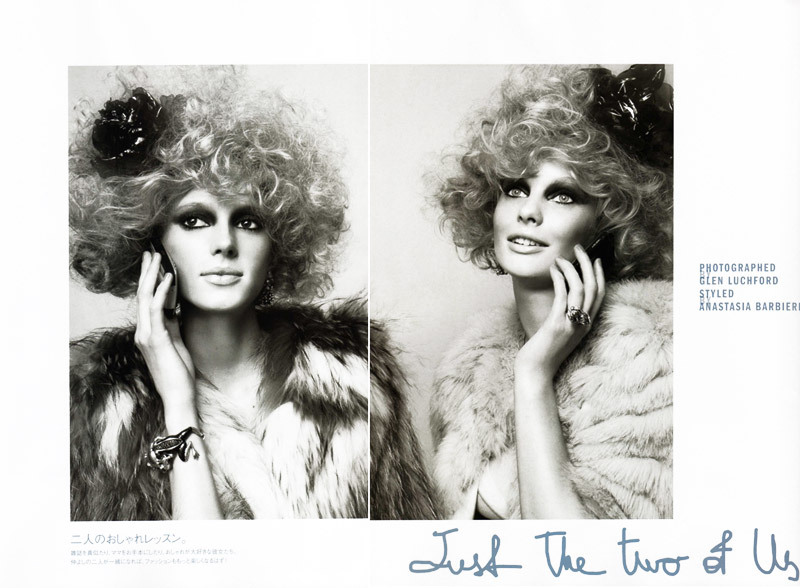 Photographed by Glen Luchford and styled by Anastasia Barbieri, the two blondes don some of the season’s most notable pieces from Yves Saint Laurent, Chanel, Bottega Venneta and others in Just the Two of Us. I love the idea, they look so cool together!! This is so fantastic!!! Love it! It's Patricia van der Vliet! This Dutch model rocks fashionworld at the moment! where that ‘lips’ dresses came from? what brand? i love that they jump from decade to decade. 80's, 60's, 90's, whatever. This was well styl’d! this is really cute! Man this is so good. The hair and makeup are out of this world excellent, esp shot 2. It is just bloody awesome and has a really sincere craziness! COOL!